The holidays are a special time for giving, and this year, consumers plan to spend an average of $819 on holiday gifts. But when the holidays come to an end, the new year all too often ushers in a big stack of bills. Last year, Americans with holiday debt added an average of $1,054 to their credit cards. And this year, individuals are going into the holiday season already burdened with larger than average debt. For instance, the average credit card balance in the Centennial State is $9,108, ranking seventh highest in the nation. At FirstBank, we want to help you enjoy the holidays – and the new year. So to help you spend and stress less, here are ten of our favorite time-tested ways to celebrate the season without breaking the bank. Write down everyone you plan to give gifts to, from your nearest and dearest to your in-laws and the mail carrier. Then put a dollar figure next to each name. Setting limits will help you keep your holidays on budget. Whether you use a spreadsheet or check your bank balances on an app, keep track of your holiday spending in real time. This will help ensure you don’t overspend. The Consumer Financial Protection Bureau even found money tracking tools can help curb impulse spending, reduce financial uncertainty and make it easier to budget. Although credit cards can be useful year-round, cash can help you stick to your budget during the holidays. Before you go shopping for people on your list, take out the amount you’ve budgeted for. When the cash is gone, that shopping trip is over. 4. Try not to procrastinate. Did you know last minute holiday shoppers spent an average of $400 more than their early bird counterparts? That was what an American Research Group survey found. Truth is when you’re in a race against the clock, you’re less conscience of what and how much you’re spending. Plan ahead, and you could save hundreds. 5. Host a secret gift exchange. Whether it’s the office holiday celebration or an extended family that keeps growing bigger, you may be part of a large group of people that exchange gifts with one another. You could help everyone save time and money by suggesting a secret gift exchange, where you each pick the name of one person to buy a gift for. The added fun is that no one knows who has who. Good food is a great part of the holiday experience, and it’s always fun to have everyone over for a festive meal. But why not invite people to contribute their own special dish to the celebration? Keep track of who’s bringing what and you’ll have a less costly and stressful mealtime. 7. Dollar stores are your friend. A new chew toy for the dog? Check. Candy canes for the tree? Check. Stocking stuffers for the kids? Check. You can find great prices at dollar stores on all those little extras that can end up costing big. Don’t forget the tape and wrapping paper. 8. Take advantage of hotel discounts. If you want to get on the road at the holidays, check out some amazing hotel discounts for top destinations around the world. You may decide that lounging by the pool and ordering up room service is your idea of a great holiday tradition. Looking for other ways to save on travel? Check out these seven travel secrets that can lead to big savings. Use your special gift for knitting, baking or woodworking to make a unique present with your own hands. Or buy several small, related items to make a thoughtful “gift basket.” When you draw on your imagination, you’ll discover countless inexpensive options for gifts. Nearly six-out-of-ten Americans said they planned to give homemade gifts. 10. Offer the gift of time. Presents don’t even have to come in boxes. There are plenty of ways to show how much you care with the greatest gift of all: time. Buy a special card and write a message inside that promises an intangible gift, like an offer to babysit for new parents, host a special dinner party or shovel snow for an elderly neighbor. In fact, Deloitte data reveals that experiences, like entertaining at home or socializing outside the home, account for the biggest piece of [holiday] shoppers’ budgets. Good news. Here’s your bonus tip, and it may be the most valuable one of all – try to create traditions that don’t revolve around money. 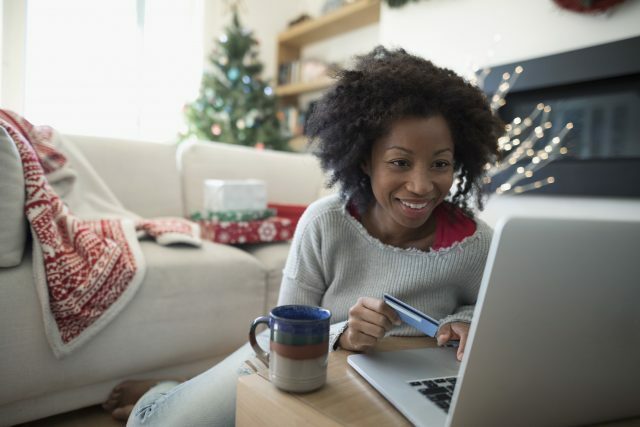 There are so many ways to experience the true spirit of the holidays without racking up a big bill. You can set up an evening of caroling and hot cocoa with friends, take the kids to view the neighborhood with the amazing holiday lights, or assemble care packages for shelters, hospitals, or the armed forces. You can’t put a price tag on those memories, and they may end up being the ones you cherish the most.